December 2012: Tips, eNews & More! Dr. Benedict and his team would like to thank you for giving us the opportunity to care for you and your family over the past year. As always, it's been a pleasure helping you maintain your oral health. The most generous compliment that we can receive is a referral of our office to your friends and family. We would be honoured to care for your friends and loved ones with the same level of care and attention that you have come to expect. If you need any dental work completed or were waiting for your dental coverage to renew, we are currently booking appointments for the New Year. You can request an appointment here or give us a call today! We are always looking for ways to improve your experience at our office and welcome your suggestions. Please take a moment to complete our short (6 question) survey and help us continue to strive for excellence in 2013. Click here to take our survey. All entrants will be entered in a draw to win delicious gourmet truffles for your family and friends to share! Other great prizes include an official Port Hope Dental scarf or blanket to keep warm during this cold winter. If you fill the survey before December 10th, you will be eligble to will our early bird prize of a REV teeth whitening kit! For full contest rules, please contact the office. Wishing You Many Reasons to Smile! On November 2, 2012 Dr. Benedict and team thoroughly enjoyed Winter Clinic. 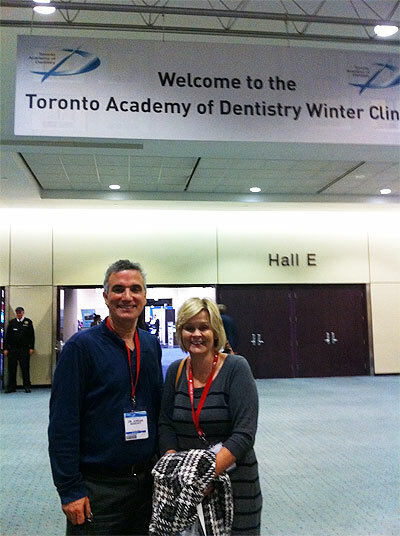 Dr. Benedict and his team are looking forward to the courses offered at ODA Spring Meeting May 2013. Click here to enlarge the picture! Our team potluck on November 27, 2012 was another huge success. Berni made a delicious sesame chicken. Click here for the recipe! Also, we really enjoyed a team building game. Click here to see some fun photos and the recipe! Sedation Dentistry at Port Hope Dental - Don't be afraid anymore! Did you know that fear is the number one reason why people avoid the dentist. Avoiding the dentist might help you ease your nerves and anxiety, but it can also make a negative impact on your oral health. Dr. Benedict is thrilled to offer Sedation Dentistry. Sedation Dentistry allows us to care for your oral health needs, while you are relaxed, under supervised sedation. Sedation Dentistry can be used for patients with dental anxiety or other conditions. Click here to learn more about Sedation Dentistry. The Spa Dent teeth whitening system is now available at Dr. Jordan Benedict's Port Hope Dental Office. With this in-office whitening system, teeth may whiten 2 - 8 shades in as little as 30 minutes. Spa Dent whitening uses a cool blue and red LED light that activates the product, whitening your teeth deeper and faster for longer lasting results. There is virtually no sensitivity. We recommend that you get your teeth cleaned before getting the whitening done for best results. Click here! To see results in our smile gallery, Click here! If you know of someone who would benefit from our dental services, please let us know. We truly appreciate your confidence and your referrals! Christmas is fast approaching and our team is holding a food drive to benefit the Northumberland Fare Share Food Bank. Please bring in a non-perishable food item between November 1 and December 11 and help us help others. Do you ever wish your teeth were straighter? Will braces get in the way of your routine, your work, your look? If an alternative were available, would you be interested? At our office we are proud to offer our patients Invisalign. Invisalign is a revolutionary alternative to traditional braces and a great tool in Adult Orthodontics. The Invisalign system allows us to offer you a more beautiful smile, without the inconveniences and aesthetic hassles associated with braces. Please call our office to book a complimentary consultation. Click here to learn more about Invisalign and watch a video. You and the family are in for a treat! What better time to enjoy warm cupcakes during the busy holiday season. 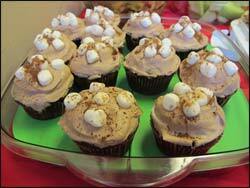 Our recipe this month is Hot Cocoa Cupcakes courtesy of Jessica! If you have a favourite recipe and you would like to see it featured in a future newsletter, we invite you to submit your recipe to dentistry@porthopedental.com.